Do you remember the scene from the movie “Idiocracy” where they talk about electrolytes? Throughout the movie they keep repeating the phrase: “It’s got electrolytes!” WTF are electrolytes? That was the initial reaction that I had (people who know me know that I use the phrase “WTF” a lot 🙂 ). I’ve seen it on sports drinks, but never had any idea of what it actually means. Electrolytes are substances that become ions in solutions and thereby get the ability to conduct electricity. A solution in this case is not an answer to a question 🙂 , but instead a homogenous mixture of two or more substances. So in this case, when electrolytes enter a solution, they become ions. An ion is an atom or a molecule that does not have the same number of electrons as protons. So basically when electrolytes enter a solution, they become ions and that means that they become electrically charged. They can be either positively or negatively charged. These then move over to positive or negative electrodes. The positive electrode is called an anode and the negative electrode is called a cathode. Here the saying “opposites attracts” comes into play. The positively-charged ions, called the cations, move to the cathode, while the negatively-charged ions, called anions, move over to the anode. Because of all this, electrolytes can conduct electricity. These are all fancy words, but what does it all have to do with training? Electrolytes are needed for the proper functioning of your body. When you train hard, you usually sweat. Sweating is your body’s way of cooling itself. This sweat contains a lot of salt, which is one of the most important electrolytes. When you are working out, you lose a lot of salts through the act of sweating. That’s why it is very important to replace these lost salts. Many bodily functions require electrolytes to function. Since electrolytes are electrically charged, they are used by the cells to maintain voltages and to carry electrical impulses. The carrying of electrical impulses is what is behind for example muscle contraction and also nerve impulses. Electrolytes are also important in the distribution of fluids throughout the body. Another important function that electrolytes perform is the regulation of pH levels in the body. The kidney is the bodily organ that regulates the level of electrolytes in your body and tries to keep it constant. Electrolytes go hand in hand with hydration. The amount of water and electrolytes in the body needs to be in balance. If there is too much water and too little electrolytes, then problems will arise. If there are too many electrolytes and too little water, then other types of problems will arise. Oftentimes during or after exercise, your body cramps up. This is your body’s way of telling you that it’s low on electrolytes and needs to replenish them. It’s sort of like the body’s version of the little oil light in your car, which tells you when you need to replace the oil. Here, it is the electrolytes that need to be replenished in the body. So in order to stop muscle cramps, you need to be constantly replenishing the electrolytes that the body is losing during the exercise that you are doing. So what are the most important electrolytes in your body? What are the key takeaways from this? If your exercise is long and intense, then you should be replenishing your electrolytes (during and after the exercise). If your exercise is short and easy, then you do not really need to replenish electrolytes, as at this point you should concentrate only on staying hydrated. The standard to guide yourself by is that exercises that last longer than an hour require a replenishment of electrolytes, while those that last less do not. However a lot also depends on the intensity of the exercise and also whether you are training at altitude or not. Let your body guide you, if you are getting cramps, then it might be time to get some quality electrolytes in. This replenishment should come in liquid form. 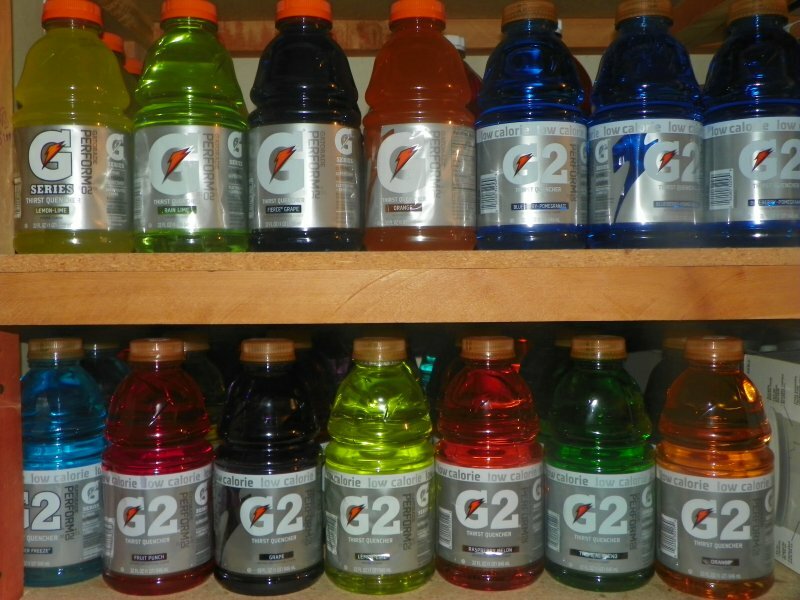 A lot of people drink sports drinks, such as Gatorade or PowerAde, in order to do that. That is what I do as well. However some people do not want to drink these types of sports drinks for various reasons, mostly for them potentially containing unhealthy ingredients. If you are one of those people, then there are some potential homemade alternatives.